Will the compatible 44917602 cartridge be suitable for our Oki B431d printer? Yes, any of the cartridges listed on this page, including the compatible Oki 44917602 high capacity black toner, will work reliably in your Oki B431d mono laser printer. Our compatible Oki 44917602 print cartridges have been strictly ckecked and tested to ensure full compatibility with the printer and have their own chip already attached to the cartridge for easy installation. If you do ever encounter any problems with our compatible Oki B431d toners then our money back guarantee ensures that you can send them back for a full refund. Stressed over the price to order Oki B431d toner cartridges these days? Luckily, right here Cartridge Save, you pay much less to get toner than anywhere else. Not only are we really affordable on the price of Oki B431d toner, we also place a great emphasis on cartridge quality. Because we focus on maintaining an efficient online business and sustaining low operating expenses, we're in the position to make available to you Oki B431d toners that set you back much less than those you might find at your local technology or computer hardware stores. We believe that you should never need to give up on print quality to buy a reasonably priced Oki B431d printer cartridge. With our no quibble guarantee on toners you don't have to take any chances. We'll offer you a full refund in the event that your Oki B431d toner fails to meet perform as you'd expect. Get your order in now with Cartridge Save and start saving. Designed to encourage high productivity, the Oki B431d is a monochrome A4 LED printer with a reliable print engine and a well-built interface so it is adept at handling heavy workloads. The Oki B431d duplex printer is relatively fast and boasts ample memory and a speedy processor, but it lacks built-in networking features that some offices may find useful. 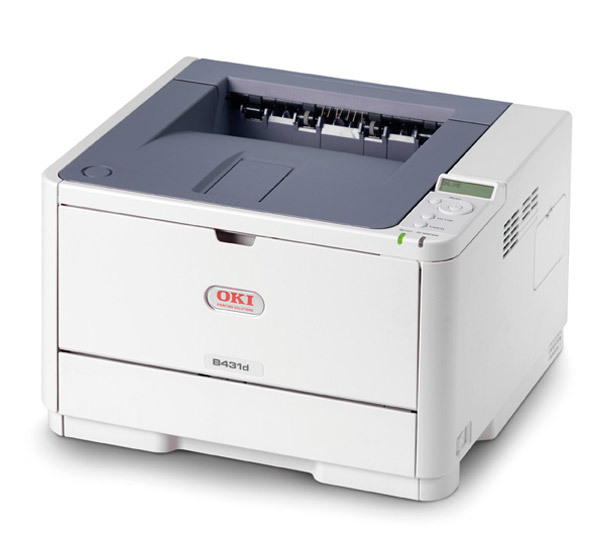 The small footprint of the Oki B431d laser printer makes it a compact solution. It is a laser-class printer with the manufacturer's digital LED technology and is integrated with a 330MHz processor. The B431d mono laser printer runs on 64MB of standard RAM and paper handling features include 2 media trays at the front face. It also has a small control panel with a flipped-up display screen. Text documents come out looking crisp and sharp from the Oki B431d LED printer because of the high 1200x1200dpi resolution. The Oki B431d printer is also praised for speed (up to 33ppm) and for its compact build. Maintaining the Oki B431d is quite easy and affordable with only the single black Oki B431d laser toner to replace. The Oki B431d drum unit is another consumable but this part is long-lasting and only requires a replacement after approximately 25,000 pages. The B-431d Oki laser printer doesn't have colour printing, and paper handling is limited to legal, letter, A5, A4, B5, and A6-sized media. The 3-year warranty for the Oki B431d monochrome printer is optional; users need to register the product with Oki as soon as possible after purchasing. Other drawbacks include the small display screen and the absence of built-in Ethernet, so workgroups might have a difficult time sharing the Oki B431d printer.